 If baseball championships are sprints, the pennant races that lead to divisional playoffs and/or the World Series are marathons during which literally hundreds of little-remembered events or moments can play important roles in determining outcomes. Anderson, a Pulitzer Prize-winning columnist for The New York Times who appreciates the summer game's long-haul appeal, offers a marvelously evocative reprise of 15 major league seasons noteworthy for their stirringly competitive and climactic flag chases. 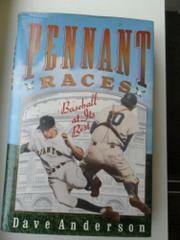 By no coincidence, perhaps, all but three of the pennant races he singles out for tellingly detailed attention occurred before 1969, after which the American and National Leagues were each split into two divisions. In the leadoff spot is 1908, a doubleheader of a year when Ty Cobb's Detroit Tigers won a close three-way battle (with Chicago and Cleveland) for the AL title while the Windy City's Cubs copped the senior-circuit crown in a first-ever playoff with the New York Giants (managed by John McGraw). Further down the order are 1934 (the Gashouse Gang, aka the St. Louis Cardinals, triumphs in a down-to-the-wire finish), 1944 (the St. Louis Browns luck into the AL franchise's only pennant with players too young, old, or debilitated to make the WW II roster), 1951 (the Giants nose out the Dodgers when Bobby Thomson takes Ralph Branca deep, breaking almost every heart in Brooklyn), and 1964 (the Philadelphia Phillies blow a big lead with but a dozen games to play, allowing the Cards to pass them in the stretch). Closer to the present, there are 1978 (the come-from-behind New York Yankees best the Boston Red Sox in a playoff recalled for the light-hitting Bucky Dent's decisive homer) and 1993 (the Atlanta Braves beat out San Francisco's Giants on the regular season's final day). This latter matchup, Anderson points out, will be the last pure pennant race because, starting this year, second-place clubs will be participating in two-stage championship series in both leagues. Whatever joys or sorrows this new format brings fans of the national pastime, they'll have the author's touchstone accounts to remind them of the times baseball was inarguably at its best. There are contemporary photos throughout the consistently absorbing text.